Coming soon from Kino Video is a real labour of love – Reel Baseball, a compilation of baseball films from the silent era. 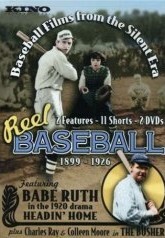 The 2-DVD set (Region 1) features mostly fiction films of baseball from 1896 to 1926. The set includes two features: The Busher (1919), featuring Charles Ray, Colleen Moore, and John Gilbert; and Headin’ Home (1920), starring baseball’s greatest, Babe Ruth. The eleven shorts include Casey at the Bat or The Fate of a “Rotten” Umpire (1899), How the Office Boy Saw the Ball Game (1906), John Bunny in Hearts and Diamonds (1914), a Felix the Cat cartoon, Felix Saves the Day (1922), and a 1922 Phonofilm sound short of the evergreen poem Casey at the Bat, recited by DeWolf Hopper. The DVD is released on 3 April, and promises to be a real gem (but what a shame all they had room for on the actuality side of things was a single minute-long Kinograms newsreel of Babe Ruth).